Can-Am started out as a race series for Group 7 sports racers with two races in Canada (Can) and four races in the US (Am). The series was initially sponsored by J-Wax. The Series used the FIA Group 7 category with unrestricted engine capacity. The Group 7 category was essentially a formula libre for sports cars; the regulations were minimal and permitted unlimited engine sizes (and allowed turbocharging and supercharging), virtually unrestricted aerodynamics, and were as close as any major international racing series ever got to anything goes. As long as the car had two seats and bodywork enclosing the wheels, and met basic safety standards, it was legal... Group 7 had arisen as a category for non-homologated sports car 'specials' in Europe and for a while in the 1960s Group 7 racing was popular in the United Kingdom as well as a class in hillclimb racing in Europe. Group 7 cars were designed more for short-distance sprints than for endurance racing. Some Group 7 cars were also built in Japan by Nissan and Toyota, but these did not compete outside their homeland (though some of the Can-Am competitors went over to race against them occasionally). SCCA sports car racing was becoming more popular with European constructors and drivers, and the US Road Racing Championship for large-capacity sports racers eventually gave rise to the Group 7 Can-Am series. There was good prize and appearance money and plenty of trade backing; the series was lucrative for its competitors but resulted, by its end, in truly outrageous cars with well over 1000 horsepower (750 kW) (some teams claimed 1500 HP in qualifying trim), wings, active downforce generation, very light weight and unheard of speeds. Similar Group 7 cars ran in the European Interserie series, but this was much lower-key than the Can-Am. A second generation of Can-Am followed, but this was a fundamentally different series based initially on converted Formula 5000 cars with closed-wheel bodies. There was also a 2L class based in Formula 2 chassis. The Can-Am is mostly remembered as the last series to allow unlimited motor racing before it became definitely over in 1974. McLaren cars were specially designed race cars. The Can-Am cars were developments of the sports cars which were introduced in 1964 for the North American sports car races. The development variants M1A and M1B were raced as factory cars in the 1966 with Bruce McLaren and Chris Amon as drivers. In 1967, specifically for the Can-Am series, the McLaren team introduced a new model, the M6. The McLaren M6 also introduced what was to become the trademark orange colour for the team. The McLaren team consisted of team owner and leader Bruce McLaren and Denny Hulme. The M6 series were a full aluminum monocoque design with no uncommon features but, for the time, uncommon attention to detail. The M6 series of cars were powered by smallblock Chevy engines built by George Boltoff for McLaren and were the model of reliability. This was followed in 1968 by the M8A, a new design based around the Chevy Mark IV "big block" engine as a stressed member of the chassis. The M8B, M8C, M8D and M20C were developments of that aluminum monocoque chassis. McLaren so dominated the 1968-1971 seasons that Can-Am was often called the "Bruce and Denny Show" after the drivers. Sadly, Bruce McLaren lost his life on June 2, 1970 at Goodwood when the rear bodywork of his prototype M8D detached during testing resulting in a totally uncontrollable car and a fatal highspeed crash. Team McLaren went on to become a several time F1 champion and is still very much a part of F1. Jim Hall's Chaparrals were very innovative, following his success in the United States Road Racing Championship (USRRC). Jim Hall's 2 series Chaparrals (built and engineered with a high degree of covert support from Chevrolet's research and development division) were leaders in the application of aerodynamics to racecars culminating with the introduction of the 2E in 1966, the first of the high wing race cars. The 2E was a defining design, and the 2G was a development of that basic design. The FIA banned movable aerodynamic devices and Chaparral responded with the 2H 1969. The 2H broke new ground, seeking to reduce drag but didn't achieve much success. The 2J that followed was perhaps the ultimate example of what Group 7 rules could allow in a racing car. It was a twin-engined car, with the by-then usual big-block Chevrolet engine providing the driving force, and a tiny snowmobile engine powering a pair of fans at the back of the car. These fans, combined with the moveable Lexan 'skirts' around the bottom of the car created a vacuum underneath the car, effectively providing the same level of downforce as the huge wings of previous vehicles, without the drag. Although far too mechanically complex to survive in racing environments, the theory was sound, and would appear in Formula One a few years later, first in Colin Chapman's Lotus cars, and even more directly in the BT46B 'Fan Car' of 1978. The Lola T-70, T-160, T-163, and T-260 were built for various customers and were generally either Chevy or Ford powered. The Lola T-70 driven by John Surtees won the first Can Am championship. Don Nichols' UoP-sponsored Shadow team made its debut with an astonishing car with tiny wheels and radiators mounted on top of the rear wing; this was unsuccessful, but later more conventional cars came to dominate the final Can-Am series as Porsche and McLaren faded from the scene. The Porsche 908 spyder was used in Can Am, but was underpowered (350 hp) and mainly used by underfunded teams. It did win the 1970 Road Atlanta race though when the more powerful cars fell out. The 917PA, a spyder version of the 917K Le Mans car, was raced, but its normally aspirated flat-12 was underpowered (530hp). In 1971 the 917/10 was introduced. This was still not turbocharged, but was lighter and had cleaner body work, and Jo Siffert managed to finish fourth in the championship. The open-air experience of a motorcycle can be terrifically fun, but there’s an obvious problem: motorcycles fall over, resulting in definite injury to the ego and possibly to the body. BRP, the company that makes Ski-Doo snowmobiles, Can-Am ATVs, and Sea Doo watercraft, thinks it has a solution: a three-wheeler called the Can-Am Spyder. Three-wheelers are not new. The British company Morgan got its start almost 100 years ago with a trike that drivers sat in and drove more or less like a car. 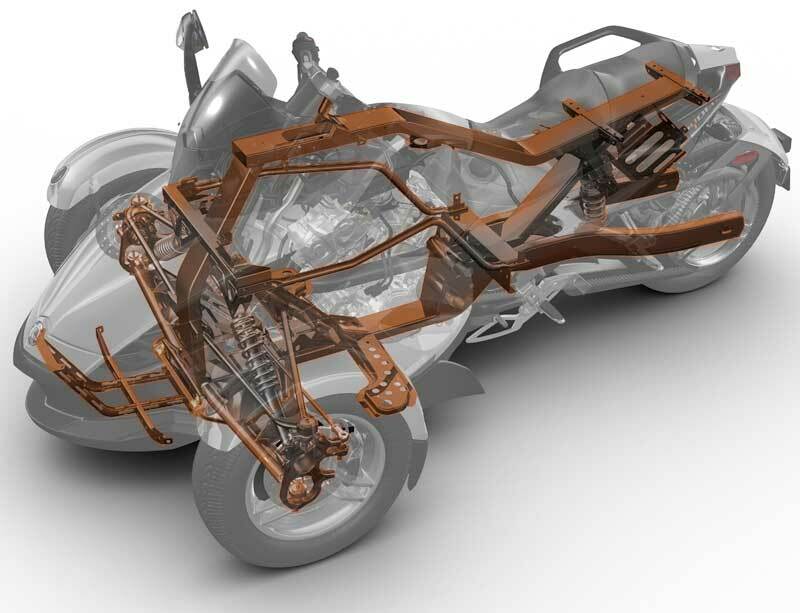 The Can Am Spyder pilot, however, straddles a motorcycle-like seat and turns the two front wheels with handlebars. By the way, the Department of Transportation considers the Spyder a motorcycle, and in all states except California, Delaware, and North Carolina, you’ll need a cycle license to ride it. In those other three, a car license will do. 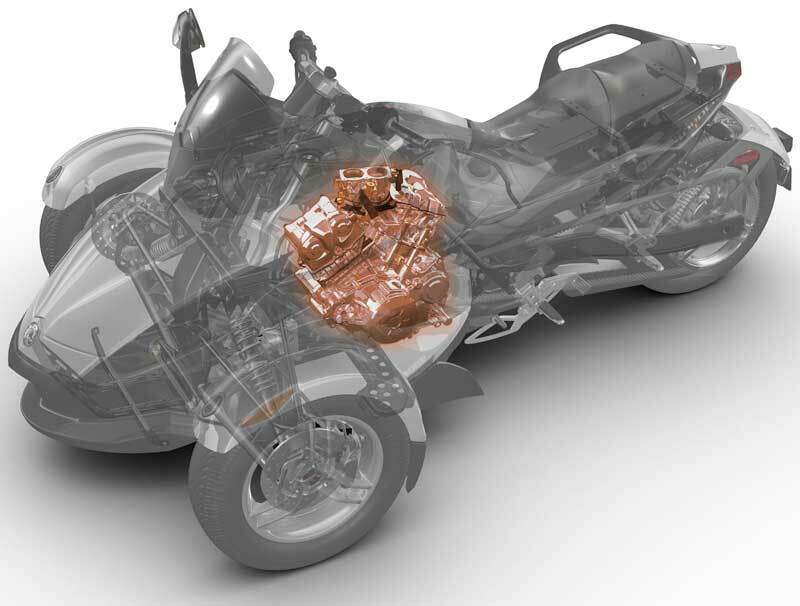 The idea here is to bring the motorcycle experience to a vehicle that’s much easier to operate. Motorcycles can be tricky to learn, as the control layout is different, and you have to shift your weight and lean into corners. Sure, plenty of folks figure it out—about 700,000 street bikes are sold every year—but the learning curve can be a barrier to entry. 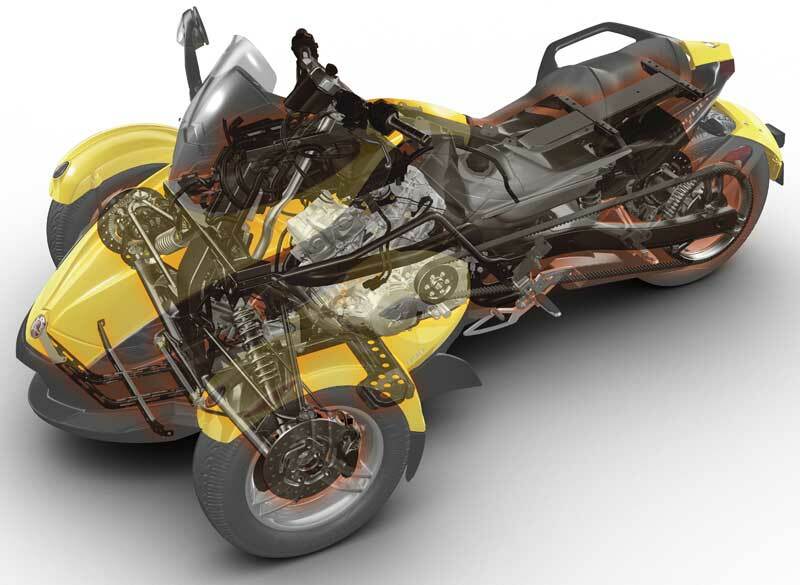 The Can Am Spyder has several features that make it easy to ride. 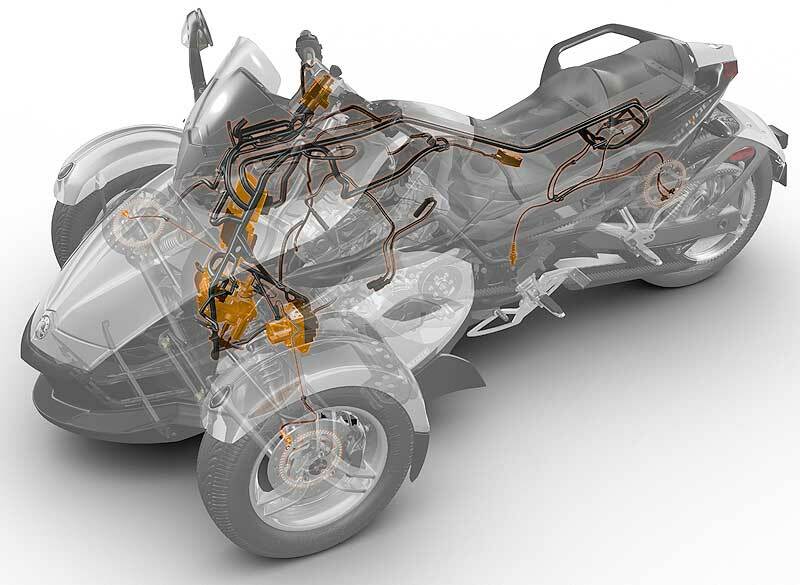 Whereas motorcycles typically have a hand lever for the front brake and a foot pedal for the rear, the Spyder’s brakes are linked and actuated only by a right-foot pedal. And, very unusual for bikes, these are standard anti-lock brakes, and the Spyder also has a traction- and stability-control systems. Steering effort is light, thanks to electric assist, a vacuum booster lightens the clutch pull, and a reverse gear aids parking. If this sounds like “Motorcycling for Dummies,” you’re right. Although hard-core knee draggers may deride the Spyder as a cycle with training wheels, it’s not really meant for them. It is, however, undeniably fun to ride. We didn’t get a chance to do an instrumented test, but from our brief ride, it was obvious that the Can Am Spyder has plenty of poke. A water-cooled 1.0-liter V-2 pumps out 106 horsepower, which the company claims should be enough to propel the roughly 750-pound trike to 60 mph in 4.5 seconds. Frankly, it felt quicker than that, with instant response available anywhere in its 9500-rpm range. What struck us most, however, was how quickly we were piloting the Can Am Spyder with confidence. After the first few minutes of riding, we had already buried the throttle and turned hard enough to engage the nondefeatable stability-control system. Most of us wouldn’t attempt riding a two-wheeler that aggressively. Another useful thing is that it helps you lean into turns. That’s a good thing because, unlike in a car, the rider’s body position has a noticeable effect on the vehicle’s response and, in addition, leaning alleviates the uncomfortable sensation that a hard turn might eject the rider. We found that, despite the power steering, it takes a healthy push on the handlebar to turn the wheels. The suspension—aided by tires that are inflated to only 14 psi—easily soaked up bumps and potholes, however, and the brakes arrested forward momentum with striking authority.